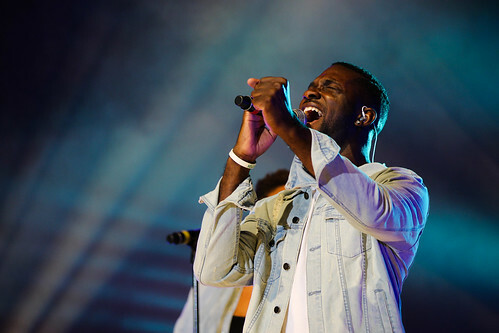 The 2017 Christian Showcase on Saturday was a night filled with standout performances, worship music and incredibly powerful vocals — most notably from winner David Dennis. As Dennis came on stage, many rushed to the front to get a closer look. From Dennis’ first song, it quickly became evident that his performance would be one to remember. Coming two years after his 2015 Urban Pop Showcase appearance, Dennis appeared to have found comfort and confidence in his new genre. As Dennis and his band started the first song, the energy filled the Curb Event Center, and didn’t leave for the rest of his set. Dennis’ vocal prowess and soulful presence brought the showcase to church, to another level entirely, and ended it on a very high note. Lauren Yaffe started the show with a brief cover of Hillsong Worship’s “What a Beautiful Name.” Yaffe was an inviting presence — she encouraged people to lift their hands and join her in singing, which set the worship tone for the rest of the night. Taylor Zebracki called on the audience to receive Jesus during her set. Thy Kingdom Come gave audience members chills with their stunning harmonies and engaging musical choices, which made all of their songs standouts. Both Jenna Nicholson and Zoë Morris demonstrated stunning individual vocals, so it was even more powerful to hear how their voices complemented one another’s. The production and mix by Belmont students was also a highlight of the show, especially after sound problems and poor mixing plagued Battle of the Belmont Bands in August. At Christian Showcase, the instruments were well blended, and vocal performances were able to shine. Acclaimed Christian singer Matthew West also gave video introductions of the performers leading into each set, which was a unique and fun way to introduce the Belmont talent. Written by Christiana Green and Sara Scannell. Photos by Carina Eudy and Shelby Thacker.